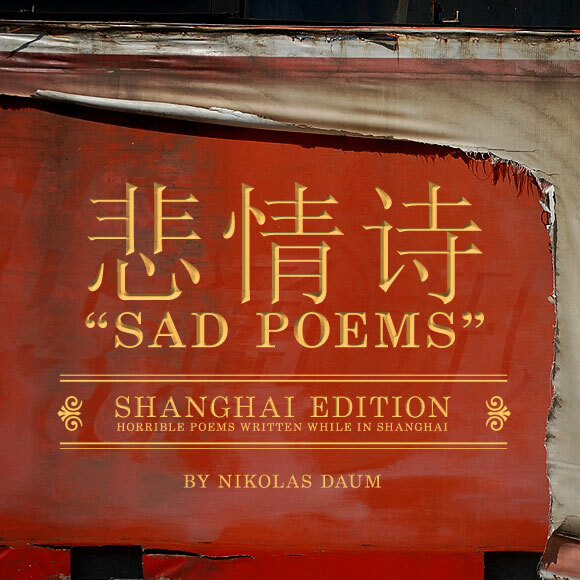 Sad Poems reflect on the darker, sadder side of life. These expertly crafted verses cut to the poignant truths of love, loss, hope, fear, desire, struggle and other human conditions. The following nuggets of sublime writesmanship are inspired by the pathos of living and working in the Orient. While not a bildungsroman, they have no shortage of spiritual development or awesomeness. To read my original Sad Poems, click on this link. I wish I knew how to ask him if there was a public bathroom nearby. A small little mouth giving a kiss to your face. No one I was arrested for writing this junk. It is made of stone and hostility. But it withstands my ability. Why would you ever build such a thing. They are certain to fall. When amoebae became bigger amoebae and dinosaurs ruled the roost. A selfish little fellow urinating on his neighbor’s roses because of some remarks the neighbor shouldn’t have made about someone else’s roses. Petty concerns these are to you, oh wise one. My roses are pretty awesome. Tired, bloated hawthorn berries for eyes. These are the marks I bare. Willy Can You Hear Me? Will can you hear me? Oh Willy can you hear me? Can you hear the sound of my heart being ripped out from behind my ample breasts when you didn’t return my text message? Just eleven characters via overpriced cellular transmission. I’m in emotional pain right now. I made your bed, and cared for your dead. I was head over heals. I needed you to realize I don’t need you.